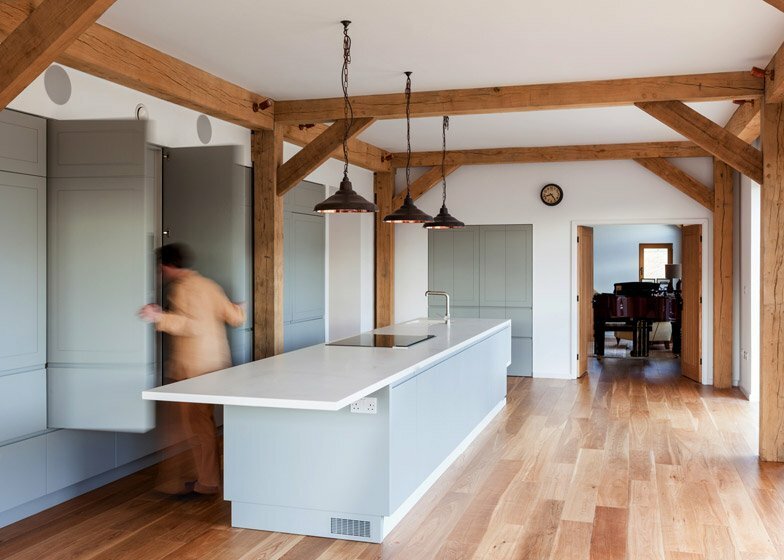 London architecture firm A-Zero has completed an oak frame house that incorporates the steel frame of an old cow shed in a rural area near Leighton Buzzard, England (+ slideshow). A-Zero was asked to design a house for a young family moving to a rural area, who had found a site occupied by old farm buildings. Rather than demolishing and disposing of all the existing structures, they wanted to use them as the starting point for the design of their home and reuse as many of the old materials as possible. 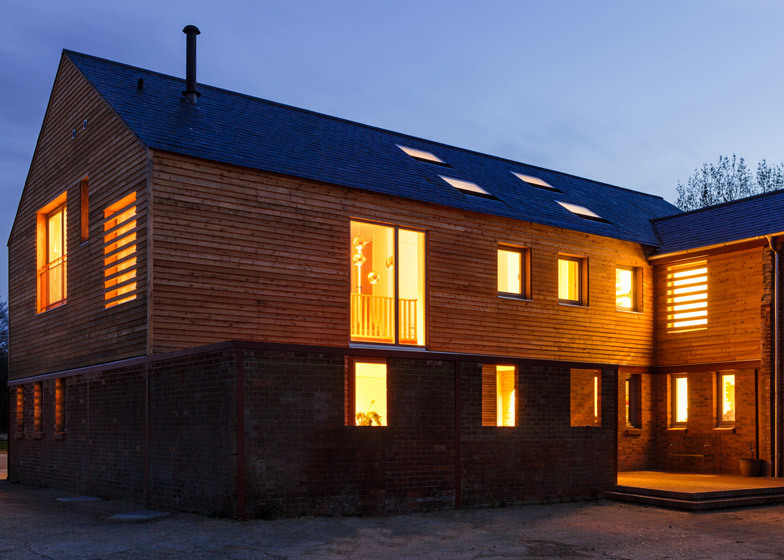 The house occupies two thirds of the footprint of the farm's old cow barn, creating a sheltered courtyard on one side. The two-metre-high brick perimeter walls of the building were kept in-situ on the northern side of the site, providing a rain and wind shield for a new entrance courtyard. 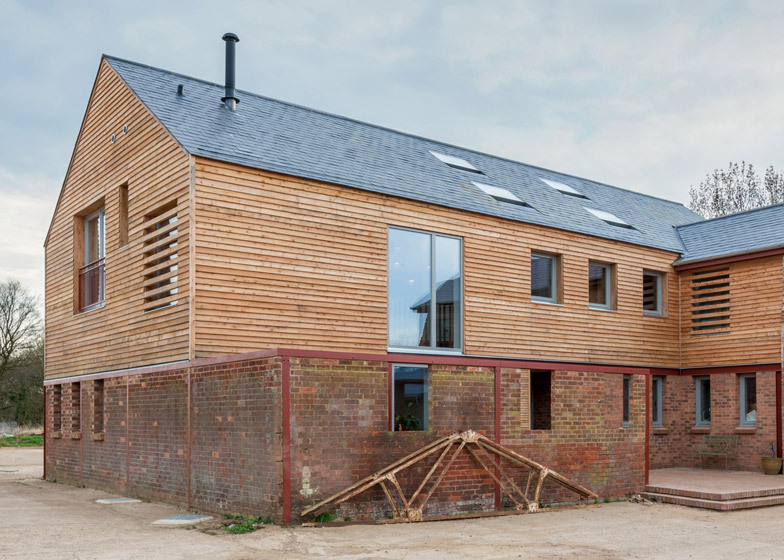 "The original organisation of the farm provided good views to the south and a sheltered courtyard to the north," explained architect Giles Bruce. "The new house works within this arrangement, glazed to the south for passive gains to the main living and dining area, and accessed via the north, away from prevailing winds." 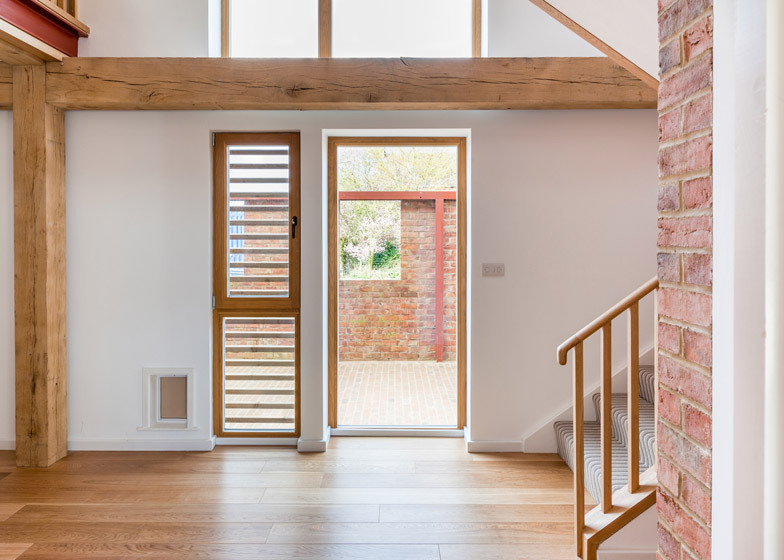 The designers and clients wanted to create an oak structure, but were concerned that natural wear would cause the wood to change and shrink over time, compromising the air tightness necessary to meet the low-energy requirements specified in the brief. 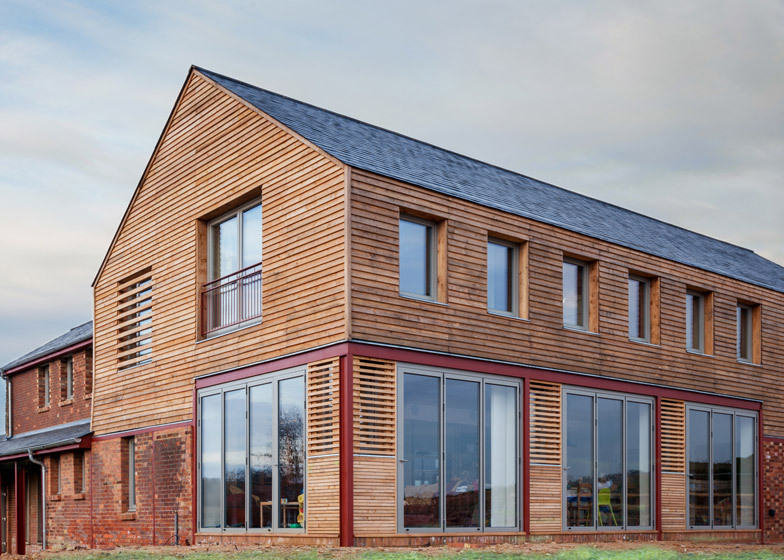 An alternative hybrid solution was developed, combining a prefabricated oak frame, 90 per cent of the old steel frame from the cow shed – finished with red paint – and layers of insulation covered with brickwork and British larch cladding. The larch on the facade also extends over some of the windows to provide privacy. Integrated guttering removes the need for overhanging eaves, minimising water run-offs that might create irregular staining of the wood. The pitched roof is covered in another blanket of insulation, and topped with slate tiles. "The new oak frame and the reused steel frame are offset relative to each other providing small openings for natural ventilation at ground level," said Bruce. 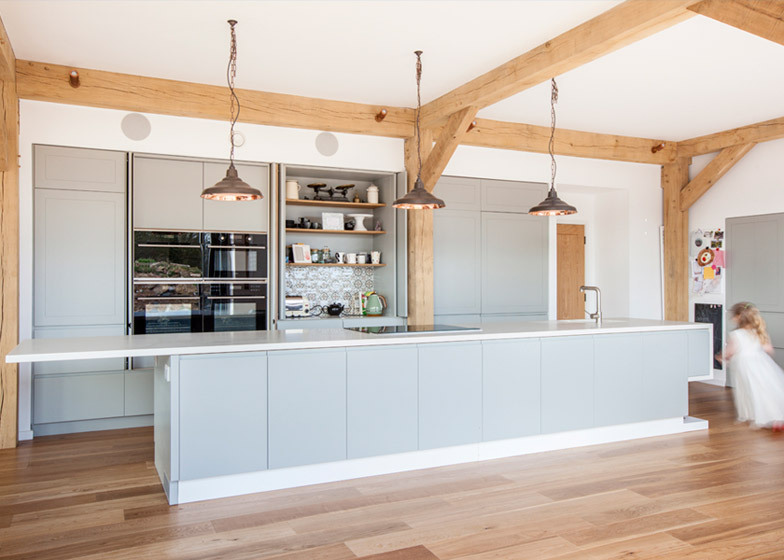 "The existing slab was left in-situ, which not only reduced the cost of pouring a new slab and foundations, it also minimised the amount of spoil that had to be removed from the site. What was excavated was redistributed around the site as a part of the landscaping strategy. This meant there was no net removal of material from the site." The south-facing facade features large areas of glazing at ground level, to use heat from the sun to warm the main living area. The glazing is arranged as a series of folding doors so the living space can be opened out to provide ventilation. 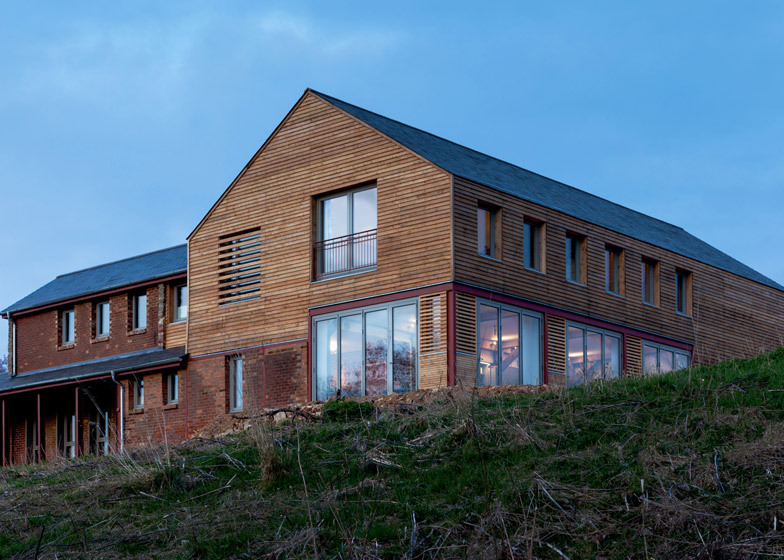 "Passive design played a key part in the external and internal layout, and the integration of active systems was all driven by a client desire for 'invisible sustainability' which very much mirrors our own approach," said Bruce. Inside, the oak frame is left exposed. Walls are painted white to highlight the wood, which is also used to create the bannisters, doors and flooring. The ground floor is largely occupied by an open-plan living and dining area that also incorporates the kitchen and connects to a sitting room at one end. A small utility room and bathroom are tucked behind the kitchen wall. Upstairs, the four main bedrooms are accessed from the landing via two small lobbies, each with their own set of steps. These stepped entrances have curved walls that are also lined with strips of larch. Situated at the far end from the main staircase, the master bedroom includes a walk-in wardrobe and en-suite bathroom. The three other bedrooms share a communal bathroom. A smaller guest bedroom to the side of the family space, housed in the brick structure that abuts the timber-framed building, has its own staircase and bathroom but is connected to the family home with a door. The remainder of this brick side building incorporates more guest areas.